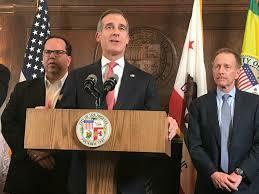 Under this agreement, it seems LAUSD will continue to socially promote students by age without consideration of their individual subjective mastery of the prior grade-level standards that students actually need to assure their subsequent academic and career success. Even though so doing would logically be much cheaper than the present costly corporate run criminal incarceration system that now awaits and captures too many needlessly uneducated ex-LAUSD students, when they finish or drop out of school completely unprepared. Under this agreement corporate vendors selling LAUSD goods and services at inflated prices far above fair market value will not only be able to continue robbing LAUSD of money for goods and services bought by LAUSD at inflated prices far above fair market value, but additional funds will also be sought by going against property tax limiting Proposition 13 with a new parcel tax to augment the funds available for these agreed upon corporate vendors to steal. As I recently mentioned in an earlier article, class size reduction in and of itself, without linking it to also eliminating the continuing social promotion policy that this agreement completely fails to address, dooms the vast majority of LAUSD's predominantly African American and Latino student populations to continued and unnecessary failure, where their timely education and academic success would be far less expensive than the subsequent incarceration that now awaits and befalls wildly disproportionately number of these predominantly minority students. The present cost per student of education was cited in the strike settlement announcement as $16,000 per year, which was seen as totally inadequate. But it would be interesting to know just how much of this money actually goes directly to things like hiring more teachers and how much goes to increasing the number of highly paid administrators or buying other things that in no way directly impacts whether a student gets the education they are entitled to. Even a cursory examination of LAUSD finances, expenditures, and longstanding rampant vendor conflicts of interest could find more than enough money to lower class sizes and student to teacher ratios- without a new parcel tax- that would allow real teaching to actually take place, if this clear and endemic LAUSD corruption, like the Belmont and Robert F. Kennedy Learning Centers, were avoided in the future. And in an age of computers, why doesn't LAUSD own the copyright of all the educational materials that it uses, instead of them being owned by large corporate publishers that unnecessarily replace and recharge for them every few years at exorbitant and unnecessary and avoidable cost to LAUSD? Couldn't LAUSD teachers of various subjects write these materials and share the copyright with LAUSD, while augmenting their own compensation? What's to stop the writing and upgrading of subject matter texts in real time that would obviate the necessity of ever paying the obscene profits to corporate publishers for subsequent unnecessary editions? I work for LAUSD and the biggest problem they have is having incompetent people at top positions. They just promote because of who they know and not for what they know. Another thing hurting the district is the lack of consequences for employees who don’t do what they are getting paid to do, there are many many workers who leave early or just don’t show up and get paid. If they get caught nothing happens! Caught stealing- nothing happens! To many people in the offices sleeping literally sleeping! Too many in management position that don’t do anything! There needs to be real consequences so all the lazy and incompetent people can either wake up and work or leave and make room for people who really will feel privileged to work for the kids- everyone here at LAUSD has forgotten we work for the kids! and not for the people at Beaudry! Another huge problem is working with uncertainty, every other day we hear of possible cuts and layoffs. It demoralizes people, it’s frustrating knowing no one is really looking out for you. Just the big dogs and their pockets! Caputo-Pearl is very slick. By wanting members to ratify this deal BEFORE ending the strike, he is actually providing strong pressure. Teachers want the strike to end because it is costing them money. Most likely, they will rubber-stamp the agreement without having the time to digest it and make a fair decision as to whether or not it should be approved. It won't be until it is too late that they realize that THEY WERE STRIKING FOR NOTHING. Class size will only be reduced by one (1) student with a little incremental reduction for the next few years. Reducing class size from 40 to 39 to 38 is NOT ENOUGH to make a noticeable difference. Somehow, LAUSD will find a way to reneg on even this paltry class size reduction. LAUSD has offered NOTHING of substance. It has only offered some tokens so that it can look like a victory for UTLA. Caputo-Pearl is no Wayne Johnson.